Preheat oven to 350 degrees and line mini muffin tins with paper liners. Note: this recipe yields 48 mini cupcakes so you will need two 24-cup mini muffin tins or have to bake them in batches using whatever size mini muffin tins you have. Mix cake according to package/recipe instructions. Once batter comes together, fill each prepared muffin cup ¾ of the way full with batter. Bake cupcakes until a toothpick inserted into the center comes out clean, about 18-20 minutes. Cool on wire rack while you prepare the icing and fruit topping. Dry berries thoroughly. It is important that they be super dry or else they will slide off of the cake. Hull and slice strawberries in half, then cut the half’s into thin slices, this will be the “stripes” in the American flag. Gently blot the strawberries with paper towel to remove any excess juice from the berries. In the bowl of an electric mixer fitted with the paddle attachment, cream butter until smooth and creamy, 2 to 3 minutes. With mixer on low speed, add 6 cups of sugar, milk, and vanilla and mix until light and fluffy. If the icing is a little too soft, add in remaining 2 cups sugar to reach a stiff frosting. Generously pipe icing onto each cupcake. You want to be generous because when the cupcakes are sitting next to each other, extra icing will fill in the gaps and make the cake look more like a flag. Note: you can spread instead of pipe but piping always looks neater. Find a large rectangular platter, slightly bigger than you think you will need for 48 cupcakes and place each cupcake side by side touching each other, making six rows of 8 cupcakes. Place the blueberries or “stars” in the upper left side corner of the cake, approximately, eight rows of eleven blueberries. Then take your strawberries and set them on their side into rows to fill in the rest of the cake. Keep cake refrigerated until guests arrive because icing will melt if left out in the heat. In Recipes-list.com we have selected the most viewed recipes from category - uncategorized . Enjoy the best recipes specially selected for you! 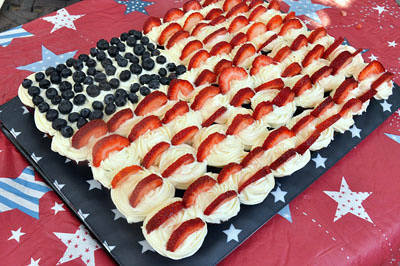 American Flag Pull Apart Cupcakes is the right choice that will satisfy all your claims.